The government isn’t mucking around when it comes to light rail in Auckland. Less than two weeks after confirming it as a priority in the Auckland Transport Alignment Project (ATAP), yesterday they announced they’re launching the procurement process and that they’ve already received an unsolicited proposal for it. This is a really positive step forward. There’s always a risk when projects get announced that they can drag on for years before seeing any action. AMETI is a prime example of this. What’s more, the government appear to be looking at procuring both of the lines at the same time. In New Zealand we’ve typically cut large projects up into smaller segments to suit how we finance projects and to play to the scale of our construction industry, sometimes so everyone gets a piece of the action. The Western Ring Route and City Rail Link are examples of this. But that can also miss opportunities for more efficient delivery and timing. Using the City Rail Link as an example, the main works contract (C3), the tendering of which has been having problems, will build the stations and bored tunnels from Albert St to Mt Eden. A separate contract (C7) is being let to install the rail related systems (tracks, signalling, traction etc). Because they’re separate, it’s possible those working on that C7 contract will have to wait until C3 is fully completed and signed off before they can start their work. If however it was all part of one contract, the contractor may choose to install the tracks as they go, while they’ve got their equipment in the tunnels, thereby allowing the job to be finished quicker and cheaper. By including both lines in the procurement process, it may reveal options and opportunities that might not be feasible otherwise. Furthermore, because of the combined size of the projects, it’s already attracted interest. It appears the Super Fund want to build and own the network in perpetuity. That’s obviously one option but there are others too. When the officials and politicians sit down to assess the proposals that come in, one thing I hope they do is ensure that any light rail network is integrated into HOP and Auckland Transport’s fare structure. What we don’t want is the light rail system having a separate fare and/or having surcharges for use, such as the Sydney Airport train stations. Let’s hope they can get the procurement sorted soon so we can start building the thing. Ideally if they govern like they plan to be there for six to nine years that won’t be a problem. I’d be surprised if the current govt make it to the next election, thinking about Taxinder as PM for the next 6-9 years is a horrible thought, she’s no Helen Clark. Better chance of making the next election than Bridges at least! I read today that they want to have it built in six years, give or take. I think that it was the same article that National’s “transport” spokesman advised that if they get elected they’ll cancel it. Well. Hollow words indeed. Pretty hard to cancel it once they’ve started laying track! My thinking is that if we get shovels in the ground before year end, it’ll be prohibitively expensive to cancel or buy out the contract – Here’s hoping. National won’t get back in for years. They’re voted in by farmers. The future of the world is urban… And seriously – putting Bridges and Bennett up as the answer? So what, that’s the 2017 election. The 2020 outcome will be different again. Based on opinion polling, the government is looking stronger now than what it polled on election day. The point is that to say that National isn’t an urban party is not supported by facts. I am not prepared to call the election in 2.5 years time – so who knows? I’m fiscally conservative and had always previously voted National. I voted Labour in the last election as I believed that the Nats dropped the ball on housing and transport in Auckland. Regardless of my fundamental differences to a lot of Labour policies, if National keep progressing with this anti-PT rant (Jamie Lee-Ross and Collins), they won’t get my vote back. They’re falling into the trap of putting politics above logic. Many urbans can (and do) have empathy deficits, kneejerk reactions to change and a willingness to ignore facts that don’t suit their worldview. The Nats aren’t likely to get into trouble unless they alienate moderates by overpandering or if a more extreme party steals this demographic. Shovels in the ground to lay track would typically be the last two years of the six years. Most of the front end is consents, property, relocating services and setting up. As it stands right now, first tracks are planned to be laid in 2023 with a view to opening in 2025. There is plenty of time for this to be stopped or altered. Reminds me of a purchase of F16’s that was cancelled by the incoming government. Can you please explain why our Transport Minister calls trains that travel at a total average speed to the airport of less than 30kmph rapid rail (26-29kmph depdending on route agreed)? This would be the slowest new airport rail link in any international city in the world. I would love to see light rail helping central Auckland but why would people leave their cars/uber for this? Paul, Plenty has been written on this very website about the pros and cons of the light rail lines and their projected performance. You may have many posts and articles but still you did not answer the most obvious question, a slow link is a waste of time and will not get airport patronage. This is light rail at any cost without thinking about a future and growth of the airport. I doubt many overseas travelers would give a toss about the average speed. All they will see is a single seat ride that will get them to the CBD well within an hour for just $4.80. Uber or taxis can’t compete with this price and at many times of the day can’t compete by time either. Any line that is quicker will require an express service, why does the airport need an express service for travellers when people from Papakura and Swanson put up with all-stops services every day? Travellers often hop on a bus tour that shows an overview of the city as the first thing they do, then return to the ones they’re interested in. To a limited extent, and without much extra time no matter who’s doing the calculating, an LR service at street level will provide an overview of one corridor through the city. Ticks the box for travellers’ needs anyway, even if that was more important than providing access for city residents (which it’s not). Fully agree. I tend to write my trip from the airport to my accommodation off as sightseeing when I arrive somewhere new, unless of course it is underground! Dominion Rd will actually be a bit more interesting than the typical scenery seen on a suburban railway line. Jezza – where does the $4.80 come from? Surely bound to be twice as much at least – probably triple or quadruple. But still going to be the ticket for me. That’s the current HOP card price of a trip on PT from the Airport to the CBD. I haven’t heard any suggestions that there will be any special airport surcharges or that LR will sit outside the integrated ticketing system. It seems to be standard practice that airport charges are considerably more than standard charges. See Wellington PT, Christchurch PT, Heathrow Express, etc. I bet you it will be more. I so hope I’m wrong though! Yes “I hope they do is ensure that any light rail network is integrated into HOP and Auckland Transport’s fare structure. What we don’t want is the light rail system having a separate fare and/or having surcharges for use, such as the Sydney Airport train stations.” If we don’t the whole thing would be a big fail. Average human – it varies, Chicago and San Francisco don’t have extra charges. Heathrow has a standard charge for the tube, it is just the express service that charges a premium. Also in Christchurch it is the standard charge if you use your Metro card. I think if they charge too much Skybus will start licking their lips. Give me the choice and I will pay for the higher speed service every time. I do this in Oslo on the gardermoen express, it’s faster than the local train and in Copenhagen where the heavy rail line is also fast to the central station than the light rail line. I also use Heathrow Express instead of the Piccadilly Line. Tourists will want to get from the airport to their hotel in the CBD as quickly as possible, not trundling through Auckland’s inner suburbs. Rob – That’s fine, you can continue to use a taxi or whatever option you think is an express. If tourists currently take taxi’s or use a tour bus when they get picked up then I’m sure they’ll continue to do so, regardless of a PT choice. “My preference = what should be built” arguments really annoy me. Integrating with HOP is essential, having an extra fare zone bubble around the airport (similar to Vancouver) is all that is required. @Rob – Well good for you. 01anthony’s comment reminded me to reply. Other tourists like to take a slower journey if they have time to look at the city they are in along the way, isn’t that why some visit in the first place? The other issue, Paul, is frequency. If we had a pure airport express service using HR, it would be very unlikely that it had sufficient patronage to warrant more than a half-hourly service. Compare that to 15 minute minimum intervals for LRT. Probably better than that though. Your time saving gets cancelled easily by that factor alone. Measure your trip from Britomart to Airport (not sure about why you focus on Aotea Britomart is our transport central?). Look at time duration of 45 mins (assumes good flow on Dom Rd), and a distance of 21 – 22.9 km between Britomart & Aotea. Speed is between 26-29 kmph depending on a direct route or one using your pushed path. I want to see light rail, but I am very concerned about the metrics used for an airport connection (would exclude it as a separate project). At off-peak there is no incentive to use it so will damage any PPP opportunity, which needs users from the airport outside peak to make the service work. I live near Dominion Rd and would love to see Light Rail but not at this price. New Delhi and San Paulo do it better at 31 kmph and higher. The is a new project we should do it right with all the right facts and justification so we can look back and be proud. This will be like the old four-lane harbour bridge or the 2 rail Britomart entrance, that has cost a lot of money to fix politics is driving a solution that makes no sense. And Brisbane Airport survives with a single HR rail line doing a 15 min frequency and works well. Thats about the same speed as out other rail lines, and plenty of people use those just fine. It’s also about twice as fast as many other urban rail systems, the Paris metro for example. And really who cares about the airport. That’s one station on a network that adds thirty something new ones. It could stop short for all I care. Britomart is ‘transport central’ because it’s the end of the line. It won’t be once the CRL opens. It also frees up bus capacity in the central city. We cannot keep firing buses down Dominion Road and into Auckland because the whole CBD will grind to a halt. This is what HR advocates fail to realise: you will still need to build Light Rail no matter what happens to the airport. So then the burden of proof really becomes “Is it cheaper to run HR to the airport when you consider you still also have to build Light Rail almost everywhere else”. Your work also assumed the EMUs would be ten minutes faster than the DMUs, but they turned out to be five minutes slower. Your same assumption process here will similarly turn out to be wrong. But whomever invests $4b into this project will sort the truth out first. If they don’t, it’ll be disaster. The Airport times have already been revised up from 43 to 45 minutes. I am quite certain further revision will take us up to around 55 minutes, then when actual testing happens the final, and very much inevitable, 60 minutes will be confirmed. Express trains would have done it in 33 minutes, and capitalised on the CRL and a pre-existing triple track mass transit line. As for future generations of SH16 comuter belt travellers, they will be cursing the idiot planners of the past who lumped them with a standard gauge line to Kumeu, where they have to transfer to narrow gauge trains for the rest of the journey to Helensville. Because it takes me 60 – 90 minutes to get home at night for what is a 15 minute commute the other way at 6am. People don’t sit in congestion for fun, they do it because they can’t find a viable alternative. This gives people options they don’t currently have. Specifics of your commute and the start time please ? by bus from Helensville. ( I suppose he can work on the way!) Not exactly an everyday commute for most Aucklanders. We can get sidelined by the outliers sometimes. Coming home at 4:30: Anywhere up to 90 mins. It can take 25 mins to get from the Strand to the top of Grafton Gully. Given the massive amount of development going in at Westgate, I don’t think you can reasonably call it an ‘outlier’ suburb anymore. I think using PT to Helensville was the outlier. Something I do from time to time, but then I’m usually an outlier. 🙂 Any greenfields development needs to include PT as the better, faster option. Otherwise the outcomes of the GPS will not be reached. Ztev, since the WC was opened, the traffic on Pt Chevalier Rd has now reached record levels. It increased 8% in 8 weeks. Peak hour, it can take more than 15 minutes to drive along Meola Rd, with the slow crawl continuing along that entire “parallel to the NWM” route into town. I don’t know about the journey from Westgate to the cbd at peak hour, but I do know that the incredibly slow journey through the inner west is chosen by many of them to avoid the NWM. I believe Buttwizard’s time for the journey, and I think the engineer who calculated the traffic volume along there without regard to induced traffic and then argued against the need for a buslane at the BOI inquiry has a debt to repay the residents of the west. Paul your “facts” are incorrect. False facts? For starters the 22 km journey to the airport in 42 minutes equates to an average speed greater than 30 km/hr. Second there are slower systems connecting to airports in the world. Edinburgh LRT springs to mind. They still work, and Auckland LRT will be faster. It has already been shown that heavy rail is no quicker. The question is whether LRT can be faster than travel mode competitors (it can), not being faster than some arbitrary choice of desirable average speed. One more thing – Brisbane Airtrain went broke within a few years when it opened in the 1990s due to low patronage. If you read that article you will see that when Airtrain opened in 2001 its patronage was “well below expectations” (Ref 1). That was 17 years ago. Patronage has increased a lot since then. But in the mean time it was sold off in 2011 for $110 million (Ref 5) – half what it cost to build. I support the LRT to the airport, but there are some cautionary tales out there. Good patronage along the way to the airport will be critical to financial success. Edinburgh is so awful taking the taxi is faster and if travelling with a group of people cheaper. Brisbane’s airport train seemed to be working fine when I used it earlier this year. I would have thought the development happening in the Northwestern area would make it as much as a priority as Roskill? Hahaha I would love to but wouldn’t know where to begin. In all seriousness, the substantial Westgate developments at West Hills will add thousands of homes. Those earthworks are happening now. There’ll be hundreds of new houses by the end of next year. In terms of actual development already consented near the routes, which branch is going to have more pressure put on it in the next five years? You know, I haven’t seen any cycling infrastructure going in to those new developments. Have I missed it? What does streetview show here – foopaths separated from the roads, I think. https://www.google.com/maps/place/Westgate+Dr,+Massey,+Auckland+0614/@-36.7919911,174.610535,244m/data=!3m1!1e3!4m5!3m4!1s0x6d0d3ffbfd65fb95:0x84919ceb372d95fa!8m2!3d-36.8267073!4d174.6150883 Yet it would be in the cycling catchment for the NWLR, only 1.2 km away. West HIlls, I believe, has two connections – to Don Buck Road and Fred Taylor, both of which are a total mess for all users. You are asking for others thoughts Nicholas . You have a bad case of ‘draw lines on mapism’, time to seek counselling. ! Kumeu may benefit more from improving its existing rail line. No point starting your stage 1 above before stage 2/3. Stage 1 is not an effect network without the depot which will probably be in Puhinui. Why would the depot be in Puhinui when LR will not even run there? They would have to transport the vehicles by truck each day just to get to the start of the run. All suggestions are that the depot will be in Mt Roskill. Main depot close to the middle of the main line is the winning strategy for resilience. Mt Roskill is a good option, despite seeming off the beaten track for now. Won’t be by the time we’ve got a third or fourth route. Is there likely to be a seperate depot for the NW Line? My guess is there would be some stabling on the NW line so that units don’t have to travel to Mt Roskill each night but probably not a full maintenance depot. That’s also ignoring timing. Starting the LRT while the CRL is still under construction is not good. Nicholas, why not? The CRL and LRT are separate projects which service largely separate catchments and perform largely separate roles. They do however form key parts of the integrated rapid transit network Auckland is aiming for. Remember, we’re trying to make up for 50+ years of neglect in public transport planning and funding in Auckland, which as a city continues to grow at a rapid pace. Waiting around won’t solve any issues. Absolutely right Glen. Unless less projects start “tomorrow” the city will be subject to years and years more congestion. ATAP doesn’t have anything that that will make significant change immediately. I note that the Herald yesterday put the completion of the CRL as 2024. How long can Auckland wait? CRL will be complete 2026 despite what the Herald is reporting. Northwest line – you’re looking at 2029 before that is done. What’s your source for a 2026 completion? Is there any reason I should take your claim seriously. 1. The rapid start plan for the city LRT would see both the CRL and LRT occuring at the same time. 2. If the LRT work starts before the CRL is completed and then there needs to be an operational plan to deal with bus displacement. One of the reasons I’ve been arguing for the built back into the city from Onehunga is that the loss of bus capacity is replaced by the LRT network as it goes. Bus trips south of Mt Albert Road can be redirected via the LRT to the Onehunga transport hub. 1. Do the NW line first – the NW motorway congestion & growth out that way is more of an urgent problem if we probably think about it. Starting at a far west end (say Rosebank or Te Atatu ideally with depot on either industrial land) so to time with CRL work dates when getting to the city end. 2. Kick general traffic out of most of Queen St & use more for buses. 3. Run the NW line down Albert St rather than join up with Queen assuming that once doing the CRL bored tunnel work is happening work above can be done on this & can take the weight of LRT. The street above was going to get a make over anyway. – All the services have been sorted out down this coridor so construction of the line may be quite quick compared to Queen St where services still need to be moved. 4. This NW line could leave it’s fast motorway corridor section & link at Newton St or something to K’Rd, Pitt St, Vincent & onto Albert terminate bottom Albert. – Have no cars bottom of Albert. 5. Queen St will be a great bus/ped alternative while both CRL & LRT works going on. 6. Once disruptive CRL works complete in the city section & Albert St is clear of LRT works build airport line LRT with small depot from Wynyard Qtr end. 8. Get the Queen St LRT & street upgrade works going. City buses are now reduced and/or moved to Albert St & elsewhere during construction somewhat. Transfers to LRT maybe needed from some west services. 9. Work on Dominion Rd could probably be done started simultaneously or even before this from the Airport and/or Onehunga ends as per Nicholas Lee/Ben Ross. 10. Add in NW line split to the Queen St line at Ian McKinnon Dr (faster & more connected). Increase frequencies from 10 mins to 5mins alternating between the slower street end or faster Queen St line. 11. Continue NW line out further west. ** If that is too hard and mucks up cycleway/buses through K’rd & on Pitts St then via Ponsonby Rd & Hopetoun St (would hate to delay the cycleway/street upgrade plans!). I think some buses can work with the LRT down Albert. But frequent New Lynn route 18 which has stop on K’rd overbridge could be redirected down Queen St. Build both the NW and Mangere LRT line at the same time. Part of getting successful buy in during the early phase it making sure that small operational issues like truck EMUs from any light depot to where ever the heavy depot is located don’t cause network problems. It’s one reason why I suggest that the first stage build out should include the final location for the main (heavy) depot. In my view this is also an argument for connecting Onehunga to the NW directly as part for this first stage. Note: converting Queen St to bus only is an obvious first stage for any plans. Yes good point to connect NW line to SW/Queen St line early on. Could do that under my outline above still. “…National’s transport spokesman Jami-Lee Ross said his party was not sold on light rail in Auckland. It was not cost-effective and there was not the population to support it, he said. FFS. The best possible reading of this is they are just opposing for oppositions sake. The worst is they are stuck in a certain sort of world view that just hasn’t moved on from 1972 (before the first oil shock). Says the party who spent billions on uneconomical motorways and planned to spend another $11b more if they were elected another term. Says the party who rubbished the CRL for close to a decade before finally backing down to public pressure to its construction and subsequently 50% share of funding. Says the party who underfunded Kiwrail, expecting them to operated at profit, but is basically a god unto the trucking lobby. I’m glad they are not in government. At least they still managed to keep up welfare funding to those living a life of entitlement. I think it is a combination of being opposition for the sake of opposition, Labour did quite a bit of this as well, and them figuring out how this whole opposition thing works. I’d be very surprised if cancelling these projects will get them anywhere near government in 2020. In general in NZ Labour make the changes then National come in and let them bed in (despite campaigning against them in opposition. An example would be Working for Families and Interest Free Student loans, National were dead against them in opposition, but they are largely unchanged after nine years of government. It will play well to their base. They’ve never been enthusiastic supporters of PT or Auckland in general. They are the party of rural NZ and big business after all. If John Key hadn’t been their PM, I doubt we would have seen any investment in PT at all. You can say what you like about the man, but he knew way before his party which fights were worth it. Do you think urban Nats will walk away or demand change? I’m thinking of the young political “It’s hard being Green-Blue” type and the older ones spending their own money starting up green-leaning businesses. What urban Nats? Jamie Lee Ross is in Botany, a place starved for PT for decades. Dan Bidois in Northcote is currently campaigning anti-PT. Judith Collins in Papakura? Simeon Brown? I think Nikki Kaye has been pretty silent on it, as I think has Denise Lee. Are there any other ‘urban Nats’? For NZ’s political health it would be great if National shifted toward green policy, for problems like, sprawl, carbon emissions, water pollution, biodiversity loss and for opportunities like soil carbon sequestration. There are some political issues the country should have moved on from by now. People like the ones I listed above give me hope. Another National MP who has been very quiet on it is Chris Penk, for Helensville. Helensville might not be as urban as most other Auckland electorates but it does have the built up areas of Kumeu, Huapai, Waimauku and Riverhead. Westgate also lies on the fringe of Upper Harbour, Paula Bennett’s electorate. LRT benefits the people of his electorate significantly and he probably knows it. I’ve never understood why a party would bother pandering to their own base unless they have competition. In this case National have the ‘right wing’ anti progress vote sown up regardless of whether National support light rail as those voters have no alternative (ACT maybe). They should be trying to win more youth/progressive votes to get them across the line. National got a pretty reasonable number of votes in Auckland last election, they could be risking a lot of those considering most Aucklanders do want better PT. I think they are trying to get revenge for Labour saying they would reverse the power company sell off. Elections are often won or lost not on who has the largest base but who has the most energised voters. Often if a party isn’t listening to their base, their voters will stay away from the polls. Widening your base of support is hard without alienating your core so you avoid it unless you can also throw some red meat to them as well. Is the gardening show lady from the North Shore still alive? It’s been so long since we heard from her that I can’t remember her name. Last time I saw her, she was bitterly opposing the seymour euthanasia bill. National are ideologically opposed to public transport. It is too socialist for their liking. Cars are for individual freedom-lovers. Self-reliance etc etc. That is the only way I can explain how Jami-lee Ross would oppose light rail even if there are private investors funding most of it. Madness. This is why light rail MUST be procured as a single contract. If it’s all locked in and physical works have begun then it’ll be much harder for a future government to pull out. If it was broken up into segments and procured separately then we’d run the risk of only getting light rail from Wynyard to Britomart. That would be pretty useless and as such would fuel attacks from National and their supporters. “Light rail is useless.” “No-one uses light rail.” “It’s just a tourist attraction.” etc. Such an artificial ‘failure’ could politically hamstring the development of light rail for years. On the other hand, if National is in power when light rail is completed then it’ll be interesting to see how much they attempt to claim credit for its success*. The further they entrench themselves in their car-centric worldview the more difficult that’ll be for them. You can bet the Nats would be all over the ribbon cutting if the project was completed under their watch. They took credit for the Waterview tunnel, didn’t they? And probably some stupid voters believed them. I have always said that National voters (rather like Republicans in the US) are either rich and selfish, or just plain stupid. Like Mike Hosking, who manages to be both. $1 Billion + could have gone a long way toward solving PT problems. If I remember rightly, that was the amount lost on the asset sales thanks to LabGreen sabotage of the sale process. The National party is funded in large part by the Road lobby. Similar to the gun lobby in America and its hold on the Republicans. We see “cultural arguments” for roads-first transport policy here in the same way we see similar cultural arguments in America made with guns. The fanaticism of the road lobby is on a par with the gun lobby in America. The Nats must serve their masters. All political parties have similar voter bases to appease. Labour and the Unions, National – the road lobby; farmers, the Greens – Greenpeace and social justice warriors, NZ First – the fishing industry. The last thing we need is the planning and procurement of this project to be done to meet political goals. It needs to be done properly as this infrastructure will be with us for a long time, even if this puts it at risk in 2020. I think it is unlikely National will be back in power, and I think it is even less likely they will actually cancel these projects. There will probably be a new leader and a new transport spokesperson by the next campaign when we hear what there actual policies are. Interesting thought: if the project is to be owned and operated by a consortium (such as the super fund proposals) then what ability does central government have to “cancel” such a private investment, so long as it’s properly consented and meets all relevant technical criteria? And if it was built, would any government have the balls to say to AT: “Yes, there is a lovely flash new LR system being constructed in Auckland, but we forbid you to have any connection with it”? I don’t think Bridges has thought things through quite yet. I also think that the funding mechanisms proposed are a stroke of brilliance for their ability to sidestep political games-playing. These things are not set in stone. The 2nd Labour government had a policy of building a HR line between Nelson and Blenheim, ostensibly to serve some industrial customers and new business they wanted to encourage in the Nelson region. Though they had the Ministry of Works start construction (at the Nelson end) early in 1960 (having been voted into office in 1957), it wasn’t enough to save the project. National, that had maintained a steadfast hostility to the project while in opposition, was voted into government at the end of that year and wasted little time in putting a stop to it. All that remains now is the partially completed station yard, currently occupied by a carpark and some private businesses. You’ve got three years of services divisions to deal with. If it was a busway the buses for some time would still be fossil fuel I assume, light rail is forward thinking in more ways than just it’s increased capacity. Not yet they don’t ! We just have second hand diesel buses. No electric buses anywhere yet. “focus on a busway” – maybe they should have got that underway in their 9 years, or at least had it designed! National criticised Labour for not costing up all of their promises while in opposition – well National, where is your busway design and costings? peak crackpot. Love it. If only, though. I’m sure we’ll see more. It would be great to see an OIA about what advice or reports NZTA had about future-proofing the SH16 work currently being done for Light Rail, what was and wasn’t done and the basis for rejecting it. Here. AT asked them to design Lincoln to Westgate to include a busway and they refused saying it wasn’t their job. Now all we need is a bid or two for Regional Rapid Rail… I wonder if any of those might be about to drop….? Why don’t we restrospectively demand $100m level investment in RRR as a condition of dodgy citizenship for US rich bastards? You know, push the sovereignty button early on to see what we’re up against after international events mean they start arriving in droves? Someone with charm can rephrase it appropriately. First thing the Government needs to do is press-gang Adrian Orr straight back to the NZ super fund before the new people lose all of our money. On what planet has light rail ever been a good investment? You build it as a social service or a transport link, but FFS as a financial investment? Haven’t these people ever followed the inevitable cost and time debacle that goes with every light rail system? The Super fund wouldnt be a risk sharing owner, they would only finance it for others to build and then others to run. SF would tie in a guaranteed return on their investment. if the ticket revenue doesnt cover finance and operating costs the Council makes up the difference. Why not just borrow the money directly @ 2.8% or whatever the government pays? Would the SF really finance cheaper than that? Its all a bit stupid IMO. Its just a way to pretend they are not borrowing money when they really are, and in doing so they (we) will pay a much higher finance rate. Local government would get caught up with more debt than the financiers would approve of, and it would mean a hike in interest rates reflecting the supposedly higher risk. Which would affect ALL projects, not just this one. Having the money invested by a third party is very good for local government’s financial risk status. But again that is clearly taking a risk on the construction and operation of the system. Just plain daft in my view. Thats not what ‘deliver’ means in these sort of deals. We can see with the Holiday Highway from Puhoi to Warkworth The partners fall into 3 groups, finance, design/build and finally operate. Intriguingly Fletchers who are the build partner have said they wont make any profit – but they are stuck with that. Seems to me this investment in low-carbon transport infrastructure is carrying on Orr’s set of values. But in any case, in a contract between the government and the NZ Super Fund, who wins and who loses if it is a poor investment? The only real issue here is that this isn’t a once in a lifetime investment. There will be more to follow. This should be being funded by tax directly, not allowing Big Finance to make money from clipping the ticket on the way. The beauty of NZ Super Fund being owner and contracting with government or council is that the SF is just another part of government, so getting the contract balance slightly wrong means money moving within the government. Admittedly Auckland Council’s share is not the same pot, but as both a taxpayer and ratepayer I’m not overly concerned. No it doesn’t. There are only two outcomes. If the Government gets a good deal then the Super Fund loses money. If the Government gets a bad deal, then the Super Fund makes money and their partner CDPQ Infra score a windfall. That means taxpayers money leaving NZ and going to Canada for no reason. The only way the government pays exactly what the project is worth is if the build it and own it themselves. Sorry two different workstations, I need to change the name on one but keep forgetting. Any idea how much it would cost to do Mt Roskill to the North West LRT line along the south western motorway? Would it be a quicker Airport route due to not having to crawl up Dominion Road? Maybe they could advertise this as a future option to speed up the airport link – plenty of people are questioning whether the Dominion road section will really work well (I’m not one of them BTW). I doubt it would be quicker as it is basically taking two sides of a triangle rather than one so it would have to be a pretty significant average speed advantage. It would also mean Dominion Rd buses still have to find space in the CBD and looses the connection between the Airport and the significant population around Dominion Rd. Ha ha ha ha ha ha ha. Yes, two sides of a triangle are less direct than one. True for roads as well as rail. Hey, but wouldn’t it be great to reallocate the SH20 to LR? Ha ha ha ha snort. It would only need to be 1.41 times quicker at most, quite conceivable considering less stops and higher speed. How did you get 1.41? I get 5.8km for Dominion Rd and 11.5km going via Mt Albert so just over twice the distance. The hypotenuse of a right angle triangle (the worst case scenario) is 1.41 times the adjacent. So obviously this is worse than triangular! Haha, of course! Yes, this appears to be quite a bit worse than a triangle. No, it’s just worse than a right-angled triangle. Geometry lesson: This is only true for an *isosceles* right-angle triangle – i.e. one where the Adjacent and Opposite are equal. It is certainly not true for a 3-4-5 triangle, 5-12-13 triangle, or any other right-angle triangle that is not isosceles. These sort of trams from different sort of manufactures are modular and you can order the higher numbers of sections for longer trams. But 66m , seriously ? Whats so special about Dominion Rd that it would require the longest trams in the world . A double decker bus is around 13 m long and carries 90 according to AT, 5 x double deckers are about same length as a 66m tram and guess what, carries 450 people. Wheres is the capacity advantage for the city streets, which are supposed to be too clogged with buses and we have to switch to LR ? A 3 car AM electric unit on the rail line is 72m long and carries 373 for comparison purposes. 450 people in a 66m tram, doesnt sound right. Correct, it’s the ability to hook two 33m units together in the future if demand requires it. They would keep the same frequency not reduce it. The difference between LRT and double decker buses is that buses have to maintain stopping distance, get stuck in traffic even with bus lanes and you have to find somewhere to put them once they are in town. The issue everyone seems to have forgotten is that the existing bus depot in Wynyard is about to be taken away and not replaced, which leaves a large number of buses with nowhere to park off-peak. There are provisions being made for increased layover space but taking buses off Dominion Road will be a big help to this problem and the bus congestion on Symonds Street. You you ever been to Melbourne ? I lived there for 9 years on a LR route which was great. Still long queues of trams in the City streets. I think you are incorrect about the ‘stopping distance’ as you call it. Trams too have to maintain their distance at say 30km/hr. Plus buses can stack at intersections 2 a breast where there are 2 lanes each side of the road. Trams will only ever be single file . The numbers still are 5x double decker bus is 450 people, and that isnt single file . There are obviously pluses and minus for both types, but its not all the trams way. You obviously didn’t actually read my response. Buses would be in single file bus lanes, so they would have to maintain stopping distances. 5 x double decker buses = 65m with no stopping distance at all. They won’t be two abreast and they shouldn’t be travelling in bunches anyway. If you bothered to read my post I said that the Wynyard depot is being demolished, so those buses that need to remain in town for peak use will have to lay over on the streets – this is about to happen regardless of LRT. LRV’s don’t need to maintain stopping distances because they won’t be that close together – nominally 5 minutes apart and on their own track which will be separate from general traffic. They will also get signal priority which buses would not. So there are lots of reasons for LRT vs 5 double deckers. And yes, I have been to Melbourne and no, their tram system is not the same as what is proposed here. No need for your ‘melbourne-splaining’ to me. Your ‘visits’ were for how long ? Buses now get signal priority in lots of places, because …well it works. I said trams go back to their depot after peak, where ever that is. Buses can do the same, where ever that would be. Any way its ONE light rial line down Queen St, buses will still exist for other routes. Its all concept so far anyway. If someone refutes your arguments, its time for some new ones, not just repetition of them and saying I havent read your comments. Sorry you are incorrect on all counts there. Bus Priority is not the same as LRV priority – Bus Priority is when buses go first after a red light phase, LRV Priority will actually change the signal to green so the LRV doesn’t have to stop. There are actually TWO lines along the entire route, not one, and there will be no buses or general traffic on Queen Street once the LRT is operational. As I said, there are no plans to replace the Wynyard depot, meaning that a large number of bus layover spaces will soon be required in the city. That is what is actually about to happen, whether you believe it or not is up to you. You should probably trust someone who does know rather than your own limited knowledge. You might disagree with my comments but they are based on fact unlike your own which are speculative. Ztev – the main reason signal priority works better with LR than buses is their size. An LRV might run every five minutes, to get the same capacity you would need five buses, so one a minute. It is very hard to provide signal priority with these frequencies without impacting traffic from the other direction so inevitably the buses start bunching. New era LRT and signalling is different to Melbourne’s mix of old and new systems & units from what I understand. It’s not the best example of how to run things now. Yes I think more frequency is better than longer light rail units, but the talk of even 99m? long units does sound like fun. Sydney’s new setup (Citadis X05 – 305) are 67m for Sydney & Eastern Suburbs or 33m for Dulwich Hill. Will be interesting what Auckland starts off with. We will likely start with one 33m unit to get things going, but I suspect it won’t be too long before they need the two car setup. The platforms have all been designed for this currently. The longest individual units are 57m long, most famously used in Budapest. But coupling units to form longer trains is commonplace. For example, both seattle and Dallas run 4x30m units into a train of 120m long. Us doing double 33m’s is hardly world’s anything. They should get driverless system like Vancouver, or partially driverless that are remote controlled. Without driver cost, they can run small train at very high frequency without too much cost. It enables very high frequency all day, off peak like 3 minutes. Frequency is freedom. Not going to happen with on-street sections. Correct. Only works in Dubai for the elevated Metro, they have to have drivers for the street level LRT. Car drivers are often stupid. Thats not how it works. Plainly the finance deal will be for 20 or 25 or even more years. And thats it. What happens is the Council or Government would flog the asset off again for another 25 years in return for a large up front payment. A LR line should then be completely in councils ownership and debt free at end of private finance deal but dont count on that. The line infrastructure probably will be as it’s on either AC or NZTA land. The vehicles won’t be and shouldn’t be, unless you are a proponent of AT owning a fleet of buses like in the old days? The BOOT model (Build, Own, Operate, Transfer) is common however the ministers (Roberson and Twyford) were asked about it directly yesterday and said the super fund wanted ownership in perpetuity. Sounds like a look /see and yet everyone else is saying they have all the details. The other thing I dont like its the Quebec Super Fund or related entity Caisse de dépôt et placement du Québec . They operate in a ‘crony capitalism’ basis with that other Quebec entity Bombardier. Caisse pumped $100s millions into Bombardiers technically outstanding Cseries airliner but which was poorly marketed, expensive and plagued by delays. Bombardier as well are a large producer of LRV, but have issues even in Toronto. Off topic question – Anybody know how the Eastern line train managed to derail itself in Britomart yesterday? Did the train pull into station too fast and subsequently hit the buffers at the end? Going by the pictures it looked like it hadn’t made it to the platforms so probably ran over a set of points that have failed. The derailed train was facing another train that was already at the platform. Speculation on my part. Hard to say without knowing the facts. TV last night suggested a facing turnout failure. *If* that were the case it is very a serious issue. The investigation will get to the root cause. 6 years to build? You have got to be joking. The Chinese have built longer subway lines in less time. And that is what we should be building for airport link a Metro, such that it can cross the harbour and service the north of the city – and you know, actually be rapid. Chinese governments have powers like compulsory acquisition of private property for projects that democratic governments do not. Plus their industry is geared up for those projects. Also not all of their projects have worked out as well as claimed. I think the six years is about right to do both LRT lines, starting from scratch. Look at Sydney LRT for a cautionary tale of the risks from charging in too fast. If you are underground by definition you don’t need to acquire too much private property. Sydney did not rush into the George St/ Eastern city LR believe me, they underestimated the works required to put it into an already busy surface road environment. Sound familiar? This is another project that should have been a metro – they could have used Bradfields originally envisioned Oxford St alignment. And with what they are now having to spend they probably could have built it as a metro. Considering that most of the route is lava field, that’d be horrendously expensive and slow. Act , Local government act and others. Sometimes extends to private companies, as the Miramar Golf Club in Wellington has been told the Airport Corporation wants some of the course and not agreeing isnt an option. The Public works Act provides for compulsory acquisition of land by the Government or Local Government. But I don’t think there is any provision for private companies to take your land. However they can become Requiring Authorities under the RMA if the Minister agrees. That means they could put a designation on your land. But to buy your land they either need you to agree or they need the council to take it for them. I think. But your best option is to tell them to get stuffed and go and get a resource consent for some high value use on your land so when they get to compensating they have to pay a high price. RAs can ask the Minister of Land to invoke the Public works act on their behalf.. In China, things work different. If the govt wants your land, you’re paid out (often at questionable rates) and moved out. No fuss, no court appeals. Job done. If a big company wants your land, you still get a low offer which you are well advised to accept. The heavies will come around and harass you otherwise. Yeah, I’ve heard of nail houses but those who put up that fight are rare. there is 3 plus years of consenting, 3 years of build and another year to do testing and commissioning. Don’t quote build times as this is usually the shortest period of the total build process. Nicky Willis is smart and is gamely trying in Wellington (vs Grant Robertson tho!) and seems to be buying the “build bigger roads before you can have mass transit” line that too many have swallowed. So good these two projects ripping ahead. Probably quite good as one so integration of the NW line into the Queen St line will probably be more seamless. yes that’s the great advantage here. It opens up Queen St as a Rapid Transit route. And both lines combining here means a huge saving in having to accommodate buses on city streets. Takes enormous pressure off both Symonds and Albert Sts, and the need to provide somewhere for the buses to turn around and stable. Also Queen St is the front door, this is delivering people to the heart of the biggest and fastest growing employment and education sector in the whole country. Often from dormitory suburbs with little employment (Mangere and NW), so along with the increase in access the CRL provides for other disadvantaged communities, is a huge boost to equity and economic strength for the city. Patrick. Your understanding of Rapid Transit in Queen Street is a worry. Max. 30 kmph is not “Rapid”. Do you mean “Mass Transit” at 30kmph for Queen Street? Nah that’s rapid. Faster than our trains between Britomart and Parnell go. Faster than the trains will move through the CRL. For $3 billion it better be faster than LR crawling up Queen Street!!! So you say CRL trains will crawl at what, something like twenty kilometers per hour? The section of railway line you use as an example was was half constructed in 1870’s. Though why would you choose that section as an example when surely via Orakei to the airport could be the fastest route for trains to the airport, not via the congested Newmarket line? The age of the line isn’t the issue, just look at “brunel’s billiard table” finished in 1841 – The same route is still in use, with modern trains being not that much faster than when the line was new (stations along the way cuts the average speed). Not that I’m a rail nut, Isambard Kingdom Brunel is one of the greatest engineers to have lived and has been an inspiration to me for decades. Yes, one of my women engineering friends named her son Isambard. Yes, if you look at the track out of Britomart towards Aotea, it has reverse curves and minimum radius so will be slow, Like the Quay Park junction (which is less than 20 years old, FYI). FYI, Brito to Aotea curve is mapped at 40 kph, rising to 70 up Albert St. QPJ is 25, 30 and 40 kph depending on to/fro/direction. Britomart – Parnell? You deliberately hand-picked a slow bit of track there. Why mislead with this example? CRL timing Britomart – Mt Eden I believe will be 8 min (assuming 1 min dwells at the CRL stations). Matt calculates LRT Britomart – New North Road (equiv) also at 8 min. So how do you conclude that LRT will be “Faster than the trains will move through the CRL”? – disparage HR based on the acknowledged shortcomings that it currently faces. – ignore that LRT is likely to face impediments of its own. – LRT will underperform compared to the projections currently being made. – Rail on its own corridor is inherently faster than rail running in the public street. I have a real-world example of the minimum performance we can expect of a light rail system in a car-dominated city: Sacramento, CA, USA. The Blue Line runs through the Downtown grid from Alkali Flats to 16th St/Broadway: Street running, pedestrianised lanes, 90 degree turns. 5 km, 5 stations, 14 mins. The second section south of Broadway to Meadowview is along a Freight ROW and feels FAST. 9 km, 6 stations, 17 mins. 31 km/h. Slower that it seemed. This sections has level crossings over arterials, has no curves, very flat, station spacing 1.5-2 km. This section would be comparable to Mangere. I doubt Auckland could do worse than this (no offence intended to Sac Town). Patronage for the whole of the system ~38 k/weekday with lousy bus connections and parkway stations galore. It is the state capital though, so has strong downtown employment. At 21km/h the light rail would run from Britomart to Karangahape Road in four minutes. It will literally be the fastest possible way to travel between those two points. That’s the same time as a western line train takes to get through Newmarket station by the way, which admittedly does feel very slow. Aye, it’s not too bad. Top of Wynyard to K’ Rd (3.4 km) would be 10 mins at 21 km/h. That USA example seems quite slow when watching a YouTube driver point of view video of it running between houses. Doesn’t seem to ever speed up much anywhere else either. Mostly the same stations as the Blue Line. Less exclusive right-of-way than proposed for Auckland; and many, many more stations! It ends by the Amtrak (California) Station near Old Sac Town (cue deafening noise of the I-5 freeway). Especially know when you have just proven that is incorrect. 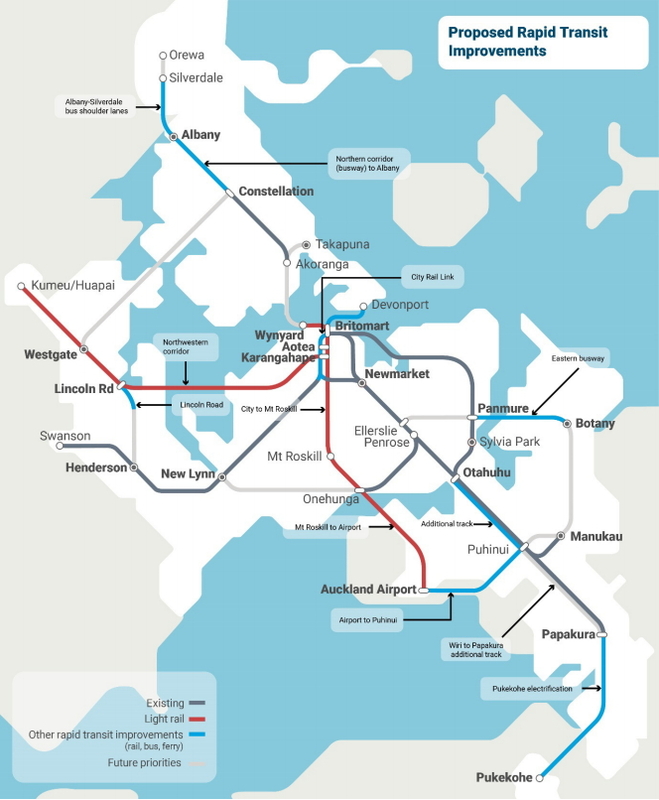 Yes Auckland will be completely different with two LR lines. It will deliver what ATAP is not. The challenge now is for a proposal to be developed for the North Shore. It seems entirely possible because like the airport line there are two strong anchor points at each end if it is constructed cleverly. There is of course the city with its employment and entertainment facilities. For a line to Albany there is the Westfield Mall with the huge volume of shoppers it attracts. Along the way it should not be difficult to provide a good connection to Wairau Park and of course there is already the growing intensification along the current busway. Roll on 2024-ish. Around that time, Auckland public transport will undergo an absolutely transformative change with the addition of the CRL and two light rail lines, plus (presumably) the Eastern Busway, all in the space of a couple of years. If we thought that the PT growth of the last few years had been stellar, the growth in the mid-2020s will be absolutely spectacular. Just got to make sure there are some decent on-road cross-town connections (Henderson to Constellation, New Lynn to Onehunga, Airport to Botany etc) operating on 24/7 bus lanes, and a primitive form of transport nirvana is ours . . .
That’s certainly decades sooner than I ever dared hope before the election. If Labour wants to demonstrate a real legacy for its time in office, it need look no further than Auckland’s rapid network-in-the-making. I seriously think it’s going to be politically really difficult for Bridges to turn back this juggernaut. An aside, bus and trains need to operate for longer hours than is currently the case. There’s aircraft disgorging passengers at 03:00, with no public transport from there until 04:45. Buses and trains don’t operate much later than 23:00 either. I’m not suggesting 1/2 hour services throughout the night, just a little later end time and a start time that takes employment center realities and airport arrivals into consideration.